Celebrated the day before Ash Wednesday, Shrove Tuesday (also called “Pancake Tuesday” or “Pancake Day”) is the final day before the 40-day period of Lent begins. This year it falls on Feb. 13. Its name comes from the Germanic-Old English word “shrive,” meaning absolve, and it is the last day of the liturgical season historically known as Shrovetide. Because it comes directly before Lent, a season of fasting and penitence, this was the day that Christians would go to be “shriven” by their confessor. Shrove Tuesday also became a day for pre-fasting indulgence. 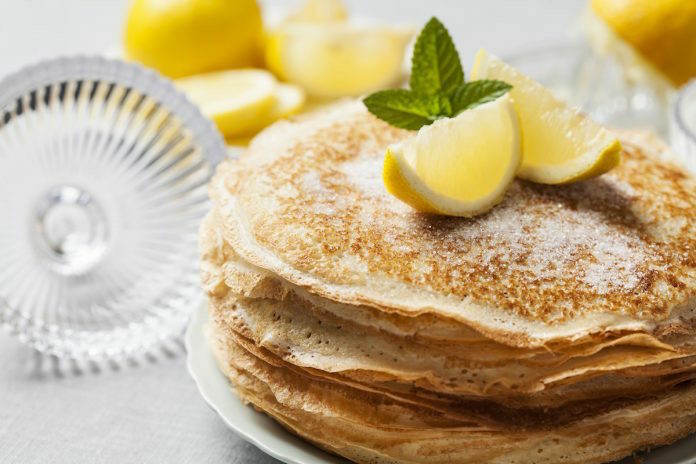 In particular, the need to use up rich ingredients such as butter, milk, sugar and eggs before Lent gave rise to the tradition of eating pancakes on this day. There are even historical references to a “pancake bell” in English towns being rung around 11 a.m. on this day to signal that it was time to get frying. For Anglican churches across Canada, Shrove Tuesday means gathering for a pancake supper. Many churches host dinners or luncheons, serving pancakes usually with a range of toppings, fruit and sides like bacon or sausages. Visitors are usually asked to give a small contribution or freewill offering. Among the creative crepe events this year is a joint Anglican and United Church hosted pancake supper at the Territory of the People’s St. Peter’s Anglican Church, in Williams Lake, B.C. Christ Church, Scarborough, in the Diocese of Toronto, will be holding a pancake and samosa supper, and Christ Church in Stouffville, Ontario, will take a cue from New Orleans with a pancake dinner set to the tunes of live jazz. While in the United Kingdom and Commonwealth countries, pancakes are traditionally eaten, other countries across the globe celebrate with different dishes. In Spain, the day is named día de la tortilla, or “omelette day,” and the traditional food is an omelette made with sausage or pork fat. 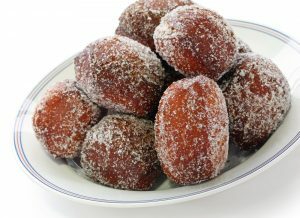 In Madeira, Portugal and Hawaii, malasadas —doughnut-like, sugar-coated confections — are eaten. In Iceland, people traditionally gorge on salted meat and peas on the day illustratively called Sprengidagur (“Bursting Day”). Green pea soup and a whipped-cream-filled pastry are the orders of the day in Finland and Estonia. Louisiana famously celebrates Mardi Gras (French for “Fat Tuesday”) on this day, a carnival that includes a giant parade through the city. Other countries, including Brazil, Belgium, the Cayman Islands, France, Russia and Ukraine, hold Mardi Gras celebrations with carnivals and festivals. In Newfoundland and Cape Breton Island, an added tradition sees small items baked into the pancakes that are served on Shrove Tuesday. These objects have symbolic value: “a coin means the person finding it will be rich; a pencil stub means he/she will be a teacher; a holy medal means they will join a religious order; a nail that they will be (or marry) a carpenter, and so on,” according to the Newfoundland and Labrador Heritage website. 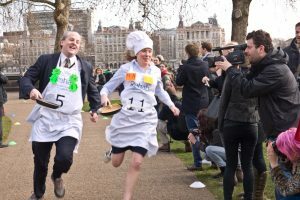 Many towns and villages throughout the United Kingdom celebrate with pancake races, in which runners with frying pans — and often wearing aprons or chefs’ hats — race while tossing and catching a pancake. In London, the Rehab Parliamentary Pancake Race takes place every year, with members of Parliament, Lords and members of the press picking up frying pans and competing to raise money for charity. — Joelle Kidd joined the Anglican Journal in 2017 as staff writer. She has worked as an editor and writer for the Winnipeg-based Fanfare Magazine Group and as freelance copy editor for Naida Communications.